Everyone is new to the gym at some point. 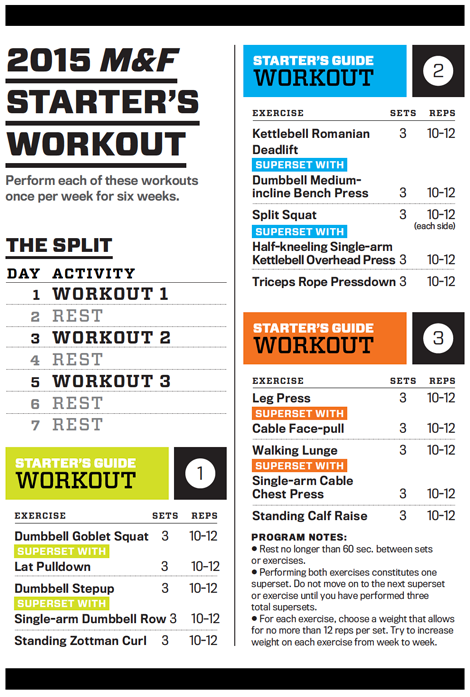 Begin your road to fitness with this 6-week, expertly-crafted exercise plan. Don't confuse starter with remedial. While this program is tailored to fit true beginners—those with little to no previous training experience—nearly anyone can benefit from putting the parameters of this program to use in the gym. That's why we don't call it a "Beginner's Guide." It's a Starter's Guide because it allows anyone — novice and advanced lifters alike — to simply start anew. You might not find any complex rep schemes or extreme techniques, but the key tactics we discuss here will definitely present challenges no matter where you're coming from. Trink's program includes three different training days that focus on basic movement patterns. "You'll tackle each one of the three workouts once per week for a total of six weeks," Trink says. Despite your enthusiasm or energy levels, resist the urge to enhance this schedule. Training more frequently than this can actually have adverse effects. A tough concept for many guys to grasp is that change happens at home, long after your last set. You're not actually growing muscle during the workout; you're breaking it down. This makes rest a crucial component of change. A general recommendation for beginners is to train every other day (or three times per week), with the Monday-Wednesday-Friday schedule being a classic example. Whatever schedule you choose, just make sure to leave at least one day between workouts. This allows your muscles, joints, and nervous system to better recuperate for the next workout. Intensity is a measure of exercise difficulty and can be influenced by total weight, rest periods, work duration, and more. Intensity boosters often used by lifters include techniques such as dropsets (reducing the weight after failure) and forced reps (having a partner help you complete more reps past failure). You've probably seen or may have tried many of these, but it's a mistake to jump right into using them here. Trink does advocate supersets, which calls for you to perform two exercises back-to-back with only minimal rest in between. This allows one muscle group to recover while another works, increasing workout efficiency while also slightly boosting intensity. Remembering the body's adaptability, you should steadily increase weight over time to keep it progressing. For you, this is especially important and beneficial, because as your body builds new neural pathways for given exercises, you become more efficient at lifting heavier weight. This levels out eventually, and you'll have to get more creative, but taking advantage of your body's quick-gain strength system at the outset gives you a huge starting advantage. "You are trying to increase the amount of weight you can use each week," Trink says. "For example, if you dumbbell goblet squat with 30 pounds the first week, try 35 pounds the second week. You may not always have the ability to increase, but that is your goal." If you've ever stopped at 10 reps when you could have done 12 or 13 or 14, then you've shortchanged your potential gains in size and strength. We've written already about not trying to push your body too far, too fast, and going to failure would constitute going too far. Nevertheless, you need to at least approach failure if you want to make progress. Not getting close enough to your physical limitations can be just as ineffective as pushing yourself too far. "You will notice that a rep range of 10 to 12 is prescribed," Trink says. "What this means is that you are shooting to get 12 reps where you could get only one more. That's called 'leaving one in the tank.' If you can get only 10 or 11 reps, that's fine. If you can't quite manage 10, then you went too heavy and need to back off the weight on the next set. And if you feel like you could have gotten 15, you went too light." As Trink has pointed out, movement patterns are key. Many experts advocate for preferential use of machines in order to train these patterns, but Trink doesn't necessarily agree. He advocates for a variety of moves using various forms of equipment. Constant tension-cable moves such as the lat pulldown appear with free-weight moves like the goblet squat. Single-arm exercises like the dumbbell row are paired with bilateral staples such as the Romanian deadlift. Stable moves like the leg press are bolstered with balance-challenged moves like the split squat. This dichotomy, Trink says, gives lifters the opportunity to benefit from a wide range of stimuli — and punch a one-way ticket to Swolesville.